A survey of lines at Apple stores in New York, Boston and Minneapolis found that crowds for the iPhone 5 are 83 percent larger than they were for the iPhone 4S, which has led one analyst to predict sales of 8 million iPhones this launch weekend. Gene Munster and his team at Piper Jaffray surveyed lines at Apple stores in the three major U.S. cities. Based on the large crowds, he thinks Apple is capable of selling 8 million of the iPhone 5 this weekend, which is the mid-point of his expectation of between 6 million and 10 million sales. Apple traditionally announces sales figures for the first three days of an iPhone launch the following Monday. If that pattern stays true, Apple is likely to tout record breaking opening weekend sales of the iPhone 5 with a press release on Sept. 24. Fanfare surrounding the iPhone 5 launch along with positive reviews of the device from technology press has given Munster confidence that Apple can sell 49 million iPhones in the December quarter. The only caveat, he said, is whether Apple can make the phones fast enough to meet demand. 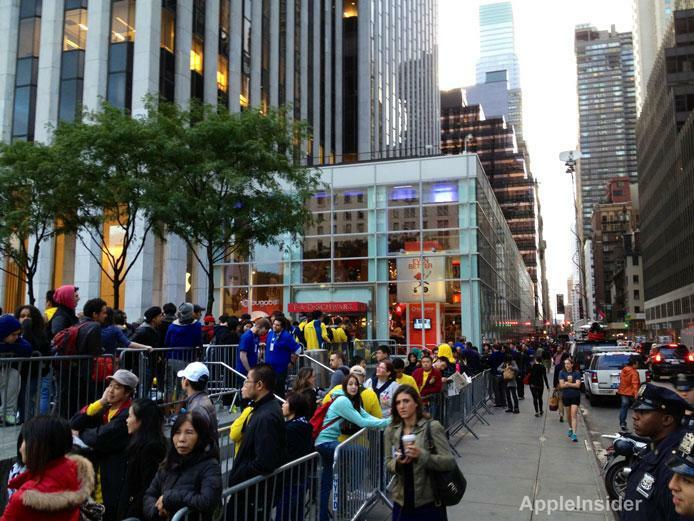 Piper Jaffray's team counted 775 customers in line for the iPhone 5 on Friday at Apple's flagship Fifth Avenue store, a 70 percent increase from last year for the iPhone 4S debut. AppleInsider was also on location when the device went on sale at 8 a.m.
Preorders for the iPhone 5 topped 2 million the first 24 hours of availability a week ago, getting the device off to a record breaking start and doubling last year's preorders. Munster believes that demand for online preorders grew at a faster rate than the line outside Apple's Fifth Avenue location because more customers are turning to online preorders.